Goodreads says, "The tale of Nutcracker, written by E.T.A. Hoffmann in 1816, has fascinated and inspired artists, composers, and audiences for almost two hundred years. It has retained its freshness because it appeals to the sense of wonder we all share. Maurice Sendak designed brilliant sets and costumes for the Pacific Northwest Ballet's Christmas production of Nutcracker and created even more magnificent pictures especially for this book. He joined with the eminent translator Ralph Manheim to produce this illustrated edition of Hoffmann's wonderful tale, destined to become a classic for all ages. The world of Nutcracker is a world of pleasures. Maurice Sendak's art illuminates the delights of Hoffmann's story in this rich and tantalizing treasure." Everyone is familiar with the classic tale of The Nutcracker, which is a perfect holiday read. What is special about this edition of The Nutcracker are Sendak's illustrations. Readers might remember Sendack as the author and illustrator of Where the Wild Things Are. Although The Nutcracker is a familiar story for some, Sendak's illustrations really enhance this classic tale and make it such an enjoyable read for children and children at heart. I personally LOVE The Nutcracker and have gone to see Pennsylvania Ballet's The Nutcracker many times. There's something about this story that is beautiful and really instills a sense of childhood wonder and imagination in the reader, which is perhaps why it is still popular although written long ago. The Nutcracker be a perfect book for a parent to read aloud to their child, especially during the holiday season. Keep in mind, this isn't a picture book; it is actually quite long as it is 120 pages. Also, the vocabulary can be tough for a young reader since it was written in the 1800's, but as a read aloud, it would be ideal and lend itself to many discussions between parent and child. I know I can't wait to share this story with my own son, especially since it has been illustrated by Sendak. I was pleasantly surprised to find that the story of The Nutcracker is a bit different than Balanchine's ballet, which I have seen many times. There are some extra side plots and stories, such as Princess Pirlipa, which really add to this memorable childhood tale. Also, Godfather Drosselmeier is a lot scarier than I remembered! The Nutcracker will keep young readers on their toes. Between Toyland, the toys that come to life, and the Rat King, children will be completely enthralled. I imagine that sharing this story with your child before taking them to see The Nutcracker ballet would be so special, especially when they see the characters and the story come to life. 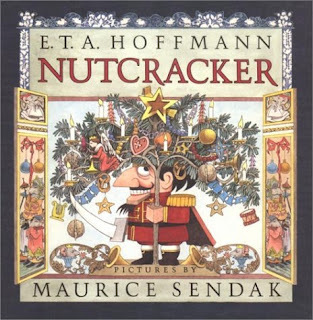 If you are looking for a beautiful classic tale this holiday season with stunning illustrations, pick up a copy of E.T.A Hoffmann's The Nutcracker with illustrations by Maurice Sendak. I love The Nutcracker - the ballet, I mean. I don't think I have ever really read the story, though. I have seen many versions (including the PA ballet!). One of my favorite versions on DVD is the one with Mikhail Baryshnikov and Gelsey Kirkland. The story is a bit different, but the dancing is wonderful. I should read this one. Maurice Sendak was amazing! Sounds awesome. I want it.